Saint Mary’s Thistle, Silybum marianum, is sometimes known as Milk Thistle. Saint Mary’s Thistle is an imposing plant with large glossy leaves with creamy-white variegations around the veins. Tradition says that the variegations originated from the milk of the Virgin which once fell upon the plant. The seeds are an important tonic for the liver. Approved bu German Commission E as a remedy for gall bladder problems, and liver problems. Saint Mary’s Thistle is a native of west Europe ans prefers dry, rocky soils in an open, sunny position. Drought and frost resistant. An annual or biennial plant, growing to 1m x 0.5m Sow in autumn, space 1m x 2m apart for comfort when harveting seed. 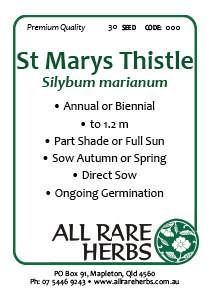 Be the first to review “St Mary’s Thistle, seed” Click here to cancel reply.